I have some sort of digestive intolerance towards eggs that are not fully cooked, although I can handle some softness in egg yolks. In the case of fried or boiled eggs, this means that the whites are set, and that there is not an overtly liquid component to the yolk. It is difficult to map this to scrambled eggs, but at the very least, I would want the eggs to be completely set (at least in the case where nothing in liquid form has been added to them). I've eaten properly cooked eggs in cafeteria settings before, and while some signs (a lack of liquid) is generally helpful, the eggs are rarely as brown or tough as what I would cook. Dryness appears to be a good measure of done-ness, but in some settings, I've had "dry" looking eggs that still tasted suspiciously soft. 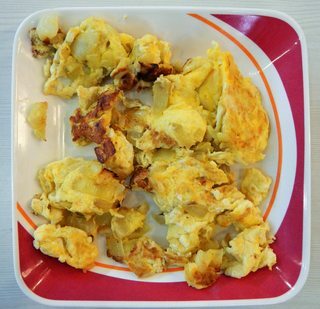 When I recook such eggs, it is difficult to judge when the eggs are fully cooked, since the pieces are far too small for setting and browning to really work well. Softness or wetness is, I suspect, a poor indicator of whether or not my eggs are done if additional "wet" ingredients (e.g. tomatoes, or perhaps milk) are added. Given this, is there a general rule for these? If liquid has been added to the eggs, what is a reasonable cooking time, after which I can assume that my eggs will be done? Perhaps this is a really "basic" question, but I rather not risk incurring any more instances of feeling sick for a few hours on the rare occasion in which I haven't been able to avoid eating scrambled eggs. Temperature is the only foolproof way to determine doneness. Unfortunately it's not very practical to carry a thermometer over to your friend's house for brunch. There are other indicators, of course, and you have mentioned the good ones for eggs. I will add, however, that some indicators can be deceiving. For example, eggs releasing a pool of liquid is actually a sign of over-cooked eggs. The protein matrix is tightening to the point that it's actually expelling water. This is different than runny, uncooked egg. Similarly, browning isn't necessary for the cooking of an egg (frankly, it's often detrimental). So while browned egg is likely more cooked than not-browned egg, it may also be less done on the inside. They are clues you can use to identify doneness but none of them are guarantees. I'd suggest sticking to fried eggs if that's what you enjoy and are more comfortable with. 1) Scrambled eggs cooked to a typical doneness are moist, not-browned, and not expelling excessive liquids on to the plate. If the eggs are not done, they will not be "set" into curds and will be noticeably slimy. That said, cook them how you like them. 2) Cooking time is dependent on cooking temperature. It's really not a good way to judge doneness. It works better for large cuts of meat or something that will take a lot of cooking time. An individual egg cooking time will vary. Yes, adding additional ingredients (mass) will slow it down. Overall it will take just a couple of minutes tops. If you start with a hot pan, you can scramble an egg in just a few seconds. Note: I'm talking about the scrambled eggs you typically see in American diners that look similar to the photos you posted. French style scrambled eggs are creamy in consistency and lack the large curds. Doneness is a little more difficult to judge in that dish. I will just add just a few observations beyond Preston Fitzgerald's excellent answer. If I understand the question, it seems to imply a preference for dry, firmly-cooked ("tough"), and somewhat browned scrambled eggs, which is what some people would refer to as "well-done" (and others might consider "overcooked"). The person asking the question also implies that there were previous bad experiences with restaurant eggs or eggs cooked by others which seemed "moist" and/or "soft" and "fluffy." But these texture differences aren't about "doneness." As long as the eggs are coagulated (without streaks of raw egg which could appear gooey or creamy depending on how close they are to set), they are likely cooked thoroughly, even if they are "moist" or "soft" or "fluffy." The differences are caused by cooking technique. In any case, this may not matter: I know someone who is sensitive to raw egg whites, and she finds any hint of unusual texture to be revolting, which aggravates the issue (seemingly even in eggs that are completely cooked, according to normal standards). If you really don't like soft or moist eggs, I'd perhaps just suggest avoiding them. I don't know where the original question is coming from geographically, but in the U.S. it's very rare to be served "American diner style" scrambled eggs at a restaurant that were not fully coagulated (i.e., "cooked"). 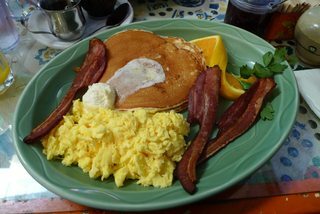 Restaurants are generally pretty careful about their scrambled egg mixtures to make sure they are fully cooked. Sometimes they're soft and moist (or even overcooked and "weepy" leaving moisture on the plate); sometimes they're dry and more firm. I've occasionally heard people special order scrambled eggs as "runny" or "wet" (i.e., undercooked), and some restaurants will do that, but that's a special order. Similarly, if you want eggs that are definitely firmly cooked, I would suggest ordering them "scrambled hard" or "well-done" or perhaps even "well-done and a little browned." Most cooks could accommodate such a request easily enough -- you're not the only one who likes scrambled eggs that way. As this seems to be a history, I'd take this to be sensitivity to a particular protein as opposed to Salmonella, though being safe in both regards is very similar. As mentioned, one of the most important factors is heat, though time is also a major factor. Heat will denature proteins as well as kill bacteria (also due to denaturing). As a note, this denaturing is what causes all of the textural (and color) changes when cooking eggs. The time is as important as the heat - things don't just magically or instantaneously cook. You mention that smaller pieces make you less certain, but smaller (thinner) pieces are actually a good sign. If the scrambled eggs are closer to one big mass, there's more likely an uncooked region towards the center. Cooking is based on the ratio of surface area to volume and always cook from outside to inside. I'm sure you've encountered a hamburger before that's burnt on the outside but raw on the inside? It's a similar issue (in the case of the burgers, we're talking high heat for less time). In eggs scrambled on a stovetop, I've never run into thoroughly cooked eggs having any liquid, including water. Expulsion of water, or syneresis, will be most evident if you're cooking your eggs too quickly (and thus leaving the inside undercooked) or for a very long time (and thus not reaching sufficient heat - or alternatively, being burnt). For yourself or with friends who cook for you, you might could try what I do, using two cooking stages. The first stage is lower heat (med or so) to reach a solid texture without burning and then to break up the egg. The second stage is higher heat to make sure they're cooked. I normally use this stage for adding any veggies or meat, and I cook the eggs to get just a slight golden brown. Not the answer you're looking for? Browse other questions tagged eggs cooking-time scrambled-eggs or ask your own question.